Bactrian camels are migratory and herds of as many as 100 may gather to journey great distances in search of food and water. 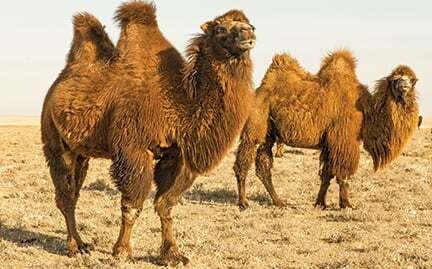 Bactrian camels are well adapted for life in their harsh desert environment. Their dense eyelashes protect their eyes from the blowing sand; nostrils that close tightly to keep out sandstorms and a two-toed hoof that facilitates travel across sandy terrain, especially on long migrations. Their two humps act as to store fat for longer periods without food.